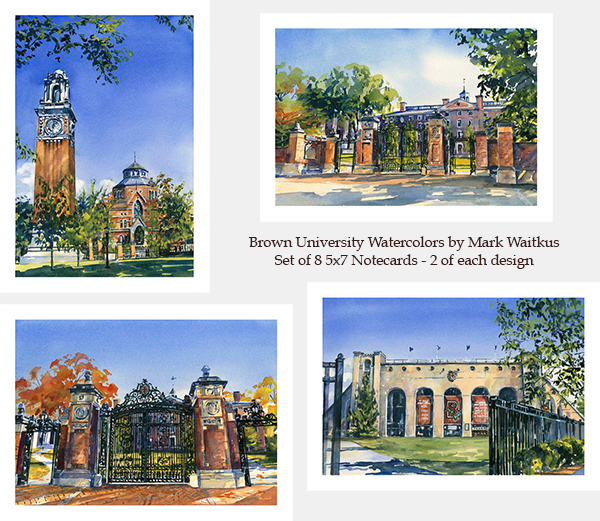 Set of 8 5"x7" boxed notecards -- 2 of each design: Carrie Tower & Robinson Hall, Brown Stadium, Van Wickle Gates, and Van Wickle Gates in the Fall. Mark Waitkus gathers inspiration for his art from historic stadiums, legendary teams, and memorable moments in sports. His expressive brush strokes and use of color bring his watercolors to life, providing a feeling of being a part of the nostalgia he recreates. Waitkus skillfully uses each and every stroke to present rich color and detail. His work has earned accolades with numerous clients including Major League Baseball, the Boston Red Sox, St. Louis Cardinals, Detroit Tigers, Cal Ripken Jr., Tony Gwynn, Gaylord Perry, the Cooperstown Baseball Hall of Fame, The New England Sports Museum and The Jimmy Fund. Set of 4 note pads, measuring 4"x6". 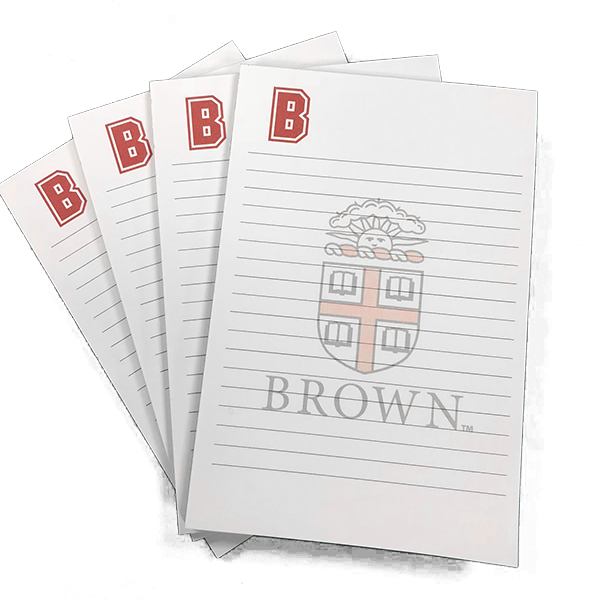 Bold, red 'B' in top left and Brown logo printed in center of sheets. 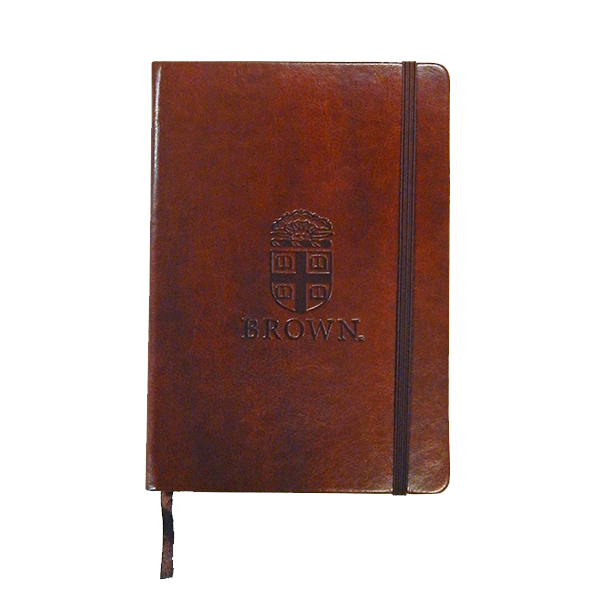 Spector & Co. brown journal with elastic closure and ribbon placeholder. Lined pages and paper pocket in back. Debossed Crest above 'BROWN' on front cover. 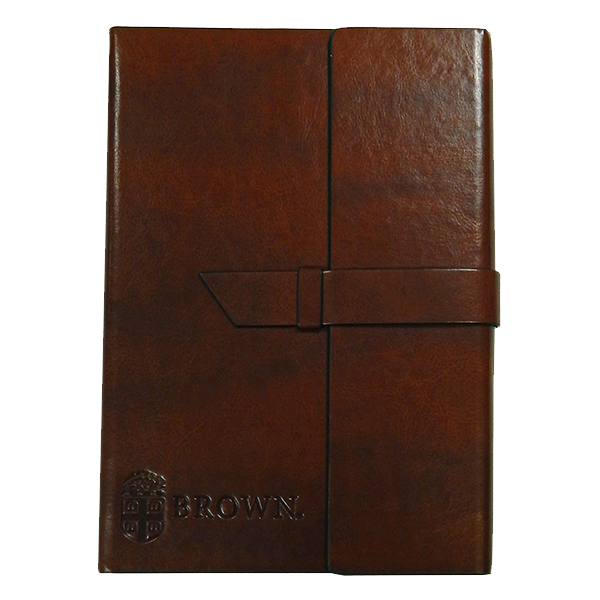 Spector & Co. brown, flapped brown journal with refillable lined, undated journal and pen loop, ballpoint pen included. Debossed Crest and 'BROWN' in lower-left corner. --Please Note: Open journal shown is the Red Journal, not Brown. Size: 6 5/8"W x 9 9/16"H x 3/4"D; Fits 6"W x 9" pad. Moleskin classic collection notebooks have 240 pages, acid-free paper, expandable inner pocket. Seal and 'BROWN' imprinted in gold. Available in plain or ruled. 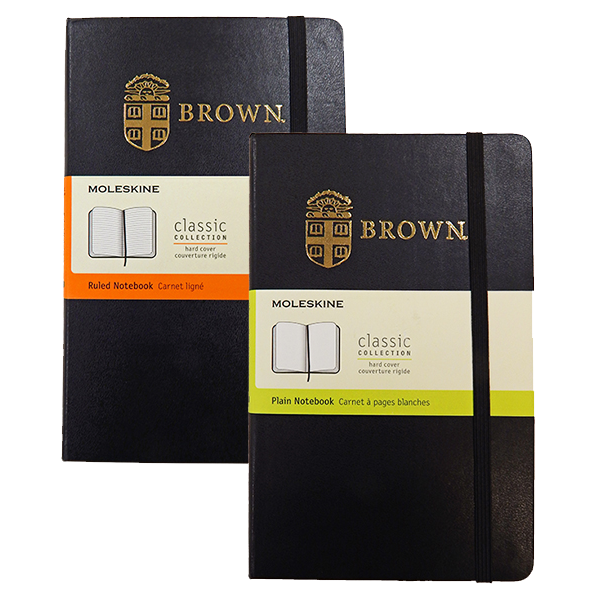 Size: 13cm x 21cm/5" x 8 1/4"
Please select option for Moleskin Classic Black Seal Notebooks - $27.99. 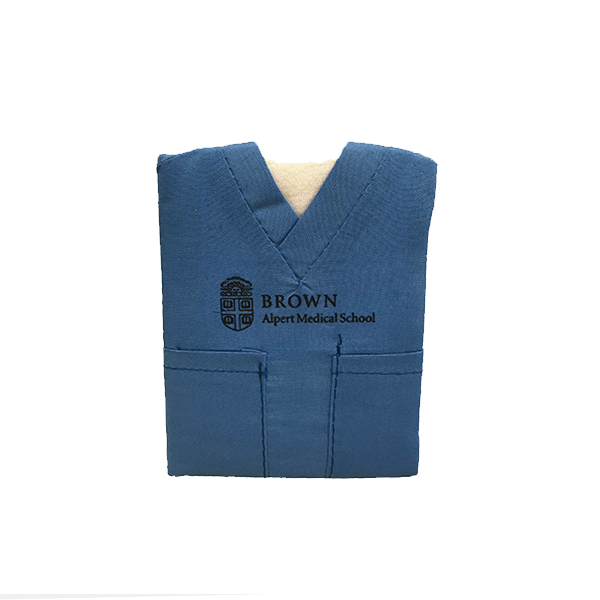 Alpert Medical School scrubs sticky notebook. Features two sizes of yellow sticky notes and 5 page marker sticky notes. Available in Red or Grey. Sticky note book featuring two sizes of yellow paper and 5 page marker stickies. 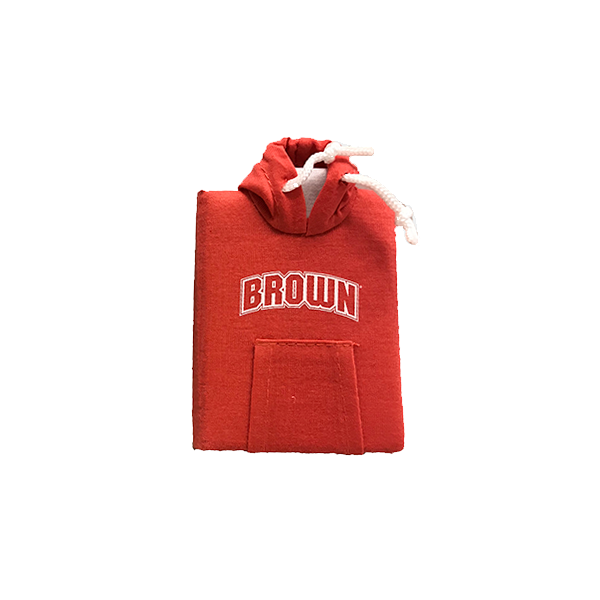 Please select option for Sweatshirt Sticky Notes - $9.99.